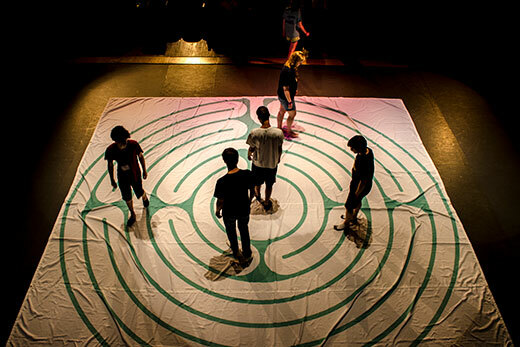 Students in Emory's Oxford College walk the labyrinth, a path used for reflection. A fall class will incorporate the labyrinth and a variety of other contemplative practices and traditions in examining critical questions of social justice. Across Emory, fall semester courses bring both new insights and historical context to critical issues, using multi-media and multi-disciplinary approaches. Want to know why elections produce the results they do? One course uses math to find the answers. How about “Howl”-ing, eating a “Naked Lunch” or getting “On the Road” to learn about the Beat Generation literary movement? This course complements a soon-to-open exhibition at the Woodruff Library. Ready to move beyond the classroom walls? Public health students will volunteer in the nearby Clarkston community, home to many recent immigrants, while Emory College students take a trip to the Georgia town where German immigrants settled in the 1700s. And there’s much, much more, including plants with medicinal power, children and media, big data and big questions like what it means to be human and where human rights come from. Fall courses also take advantage of major Emory exhibits to offer unique opportunities for students, who will learn directly from exhibit curators and have special access to materials. "Threads of Time: Tradition and Change in Indigenous American Textiles" opened last week at the Michael C. Carlos Museum. On display through Dec. 17, the exhibit explores the staggering breadth and depth of indigenous American fiber arts. The exhibit is curated by art history professor Rebecca R. Stone, Carlos Museum faculty curator of the Art of the Americas, who will give undergraduate students a first-hand look at the subject in the upper-level art history course she is teaching this semester, also titled "Threads of Time." A graduate course on "Threads of Time" is also offered through Laney Graduate School this semester. Next month, Emory's Woodruff Library opens “The Dream Machine: The Beat Generation & the Counterculture, 1940–1975.” But even before the exhibit's Sept. 28 debut, students taking Aaron Goldsman's English course on beat-writing will already be engaging with the writers' works, as they create a digital exhibition to run alongside the show, which Goldman co-curated with fellow Emory English PhD student Sarah Harsh. Course description: Today’s cancer research demands a wider synthesis of skills and people from multiple disciplines than ever before! This course will equip students with the fundamental skills necessary to address the challenges and recognize the opportunities offered by accessing, managing, analyzing and integrating diverse omic data types in cancer research, both individually and as a part of an interdisciplinary team. Students will learn when and how to apply bioinformatics analysis workflows to turn cancer genomics data into clinically translatable knowledge. Cool factor: Got BIG data? Now what? How about creating waterfalls and volcanoes, watching out for beeswarms and gathering some buckets and umbrellas? What does this have to do with cancer research? Create waterfall and volcano plots for detecting cancer gene outliers and defining gene signatures, and be sure to use a beeswarm plot for a small number of patients but with (statistical) caution! After defining a gene signature, walk through the precision medicine pathway to design umbrella and basket clinical trials for assigning treatment based on a gene signature and then finally, slide down the tunnel to personalized medicine. Course description: Since its publication in 1960, Harper Lee’s “To Kill a Mockingbird” has been one of the most widely read books in the world. The recent publication of Lee’s apprentice novel, “Go Set A Watchman,” has renewed interest in the figure of Atticus Finch and the historical and cultural sources that influenced Lee. This seminar examines the history of the American South in the Jim Crow era that prefigured both the idealized Atticus of "Mockingbird" and the reactionary Atticus of "Watchman." The class will analyze the political uses to which this character has been put since “Mockingbird’s” publication. Cool factor: The course comes out of a book that Crespino is writing that will be published next summer by Basic Books. Students will read manuscript chapters and discuss them in class. In early October, Harper Lee’s nephew, Ed Connor, a retired literature professor who lives in Jacksonville, Florida, will visit the class and discuss his family’s history and his aunt’s novels. Course description: Medical traditions based on plants as a source of medicine are found in all human cultures and date back to prehistory. In this course, both ancient and modern-day botanical traditions across many cultures will be discussed as they pertain to medicine. The class focus will be the pathways through which natural drugs are made by plants and how they affect humans. Some examples include botanical drugs for infectious disease, cancer, cardiovascular health, dental health, central nervous system function and much more. Students will have a solid understanding of the major botanical drugs, including their sources, applications and cultural relevance. Cool factor: This course teaches students to apply a multi-disciplinary lens to understanding human health and physiology. It incorporates lessons from anthropology, botany, chemistry and pharmacology to better understand how plant compounds can be used to treat disease and promote health. The course integrates guest lectures from experts in the field, in-class experiential learning activities and field trips to the Emory Herbarium and the Atlanta Botanical Gardens. Course description: Electronic screen media occupy vast amounts of contemporary children’s time in the U.S. and abroad. This course examines the role of media in children’s lives starting with babies and toddlers and moving through early and middle childhood and into the “tween” and teen years. Taking a developmental perspective on childhood, students will examine a variety of texts including content made for infants and toddlers, brands like Disney and Nickelodeon, and content used by older children and adolescents. Students learn about the changing nature of children’s media and public debates about the role of media in children’s lives. Cool factor: Students critically examine the media environment of their own childhoods, observe and interact with contemporary youth in a home or workshop setting, and consider past and current popular children’s media texts and children’s popular culture with an eye to evolving industrial and technological factors. A collaboration with the Kids Video Connection, an Atlanta youth video production and media literacy organization, provides a connection to contemporary youth and a framework for thinking about media literacy education. Course description: The ClaRC Community Engaged Learning Seminar is a combination of facilitated seminars and community volunteering that strengthens RSPH students’ ability to make positive and sustainable contributions to improving the health and well-being of vulnerable populations both locally and internationally through grassroots, relationship-based community development. The course encourages students to integrate their coursework and experiences by exploring concepts of ethically engaged community-based public health practice. The course emphasizes tools of self-awareness, cultural humility, community awareness, collaborative planning and implementation and practice of self-reflection. Cool factor: How do you show up in community? How do you show up in life? How do you work from an asset-based perspective rather than a deficit-based perspective? How do you apply this in a community setting? These questions and more come together in a seminar that helps public health students look at the role of their service and then places them in service in the most diverse square mile in the U.S. — Clarkston, Georgia. Course Description: Since 1990, a new approach to studying religion, inspired by the cognitive sciences, has emerged. Cognitive scientists of religion address imbalances in studying religion that favor interpretation over explanation, particulars over the recurrent, and experience and conscious belief over implicit cognition. Also addressed is an imbalance in the cognitive sciences, which focus on more conspicuously rational forms of mental life, e.g., scientific reasoning, even though, on any measure, humans devote far more cognitive activity to religious thinking and behavior. Readings include theoretical and methodological works that kick-started this movement and empirical and experimental studies about religious cognition it has inspired. Cool Factor: Judging by many reactions, the cognitive science of religion has proven a cutting-edge approach to studying religion with a particularly sharp point. The cognitive sciences hold that a great deal of cognitive processing is unconscious and that, accordingly, we are often clueless about how and why our minds work as they do. Cognitive scientists of religion have explored the implications of this for human religiosity, in its several manifestations, yielding numerous surprising and counterintuitive findings. Course description: This seminar will examine the “critical questions” of social justice as explored by human beings throughout the centuries such as the nature of beliefs and values, ethics, morality, spirituality, happiness and well-being, suffering, and community engagement and personal and social responsibility. Central to the class is the opportunity to explore our own minds and hearts through a variety of contemplative practices and traditions such as music, mindfulness meditation, visualization and yoga. Cool factor: Students and instructors will be invited to construct a cajita, a personal reflective box that students create with artifacts that might symbolize identity journeys, life stories, political and philosophical commentaries, etc. The cajita is particularly relevant to the study of social justice and injustice by encouraging students to examine their own positionality in their respective culture and identity. Course description: Increasing numbers of faculty and graduate students participate in the research and curation of museum and library exhibitions as part of their scholarly output and in service of public scholarship. This course will consider both theory and practice associated with such ventures as we help Emory prepare for its extensive “History of Teaching at Emory” exhibits. Students will create, discover and mine relevant archives, meet with library and museum staff to discuss philosophical and methodological aspects of such endeavors, and be given the opportunity to create segments of this project, which we anticipate will be situated in spaces on Emory’s Oxford and Atlanta campuses. Archival assignments will be designed in part to prepare students for their dissertation research. Cool factor: In addition to working with experts in Emory's Carlos Museum and Rose Library, students will hear from an extensive list of guest speakers, including Emory University Historian Gary Hauk; Harry Rusche, professor emeritus of history; Emory alumnus Doug Shipman, president and CEO of the Woodruff Arts Center; Atlanta photographer Billy Howard, whose "Epitaphs for the Living" exhibit continues through Sept. 10 in Woodruff Library; Emory PhD student Aaron Goldsman, co-curator of "The Dream Machine" exhibit; David Lowe, Emory alumnus and student activist who donated archives to the Rose Library; and sources from the DeKalb History Center and the Children's Museum. Course description: The decades following World War II were a time of momentous change in American culture, literature and politics. An upcoming exhibition at Emory’s Schatten Gallery, opening in fall 2017, takes a close look at these changes through the lens of the Beat Generation: an unruly, diverse and provocative group of writers, artists and intellectuals. This class will take a deep dive into the writing and stories behind the Beats and the counterculture more broadly, engaging with key texts of the Beat moment alongside materials from the Stuart A. Rose Manuscript, Archives and Rare Book Library. Cool factor: The class will have the opportunity to curate its own digital exhibition to run alongside the Schatten Gallery show featuring original student research on primary materials housed in the Rose Library collections. Course description: This class studies Emory’s own civil rights history through the lens of student research. Students choose topics on the history of exclusion and inclusion at the law school and university on the basis of, for example, race, gender, LGBTQ identity, religion and disability. They learn how to do archival research and oral history interviews and read about civil rights history at other universities. The students work as a research team to share ideas and research strategies as they write their own papers. The research and writing skills they learn are useful for lawyers as well as historians. Cool factor: This class was inspired by NAACP Legal Defense Fund President Sherilyn Ifill, who urges that universities must “know your history” in order to address contemporary problems. It was an experiment last year, and is back by popular demand from students. Highlights last year were an in-class oral history interview with law professor Kathleen Cleaver, the first African American female professor at Emory Law, and a session with archivists at the Rose Library. Course description: This upper-level German course will examine the presence of German in the state of Georgia, focusing on three very different phenomena that resulted in German being used and heard in Georgia: The immigration of Salzburger to coastal Georgia in the 1700s; the resettlement of Holocaust survivors in Atlanta after World War II; and the German presence in Georgia’s economy today. Following a case study approach, students will engage with primary (e.g., historical documents, first-person interviews, demographic data, city records) as well as secondary sources for each topic in order to construct a full picture of each phenomenon. Cool factor: A central component of the approach will be firsthand encounters with representatives and/or representations of each situation: an overnight field trip to New Ebenezer, Georgia, to visit the Salzburger settlement; interviews with descendants of Holocaust survivors; meetings with German and German-themed businesses in Georgia. Students will also explore the presence of German on Emory’s campus by visiting the Carlos Museum’s collection of German art and translating works in the Pitts Theology Library’s Reformation collection. Course description: This course allows first-year students to actively engage in their new surroundings in order to learn Emory and Atlanta while also practicing writing and critical thinking skills through weekly reviews of their experiences. These reviews will be published as the new go-to news source from the freshmen’s perspective. First-year students, from any field, interested in having regular social media activity as a key component in class activities, attending extracurricular events, and improving rhetorical and composition skills are invited to join in the efforts of a freshman class news blog. Cool Factor: Participants will have the opportunity to explore all that Emory has to offer and also the greater Atlanta area to make the college experience well-rounded and full. Students will discover college life in- and outside of the classroom in a way that is social yet personal via group work and reflection. They will be able to foster their own critical and creative voice, have fun, and learn balance. And every class adventure is #free99. Course description: Today’s organizations need to manage and analyze data in the form of text, video, audio and indeed numbers. This requires knowledge and use of special technologies that are at the foundation of data-driven enterprises. In this course, students gain competence in practical database, data warehousing and data management skills with emphasis on query, modeling and management of big data sets. The students also become familiar with the major elements of the big data ecosystem. Cool factor: Students have a unique opportunity to get hands-on experience on state-of-the-art data science tools while working on real-world problems. The course also features a combination of live cases and guest lectures. A large part of the course will use cloud-computing — in particular students will employ Amazon Web Services for most of their projects. Course description: This class is about the mathematics of Social Choice Theory, which is the analysis of group decision-making. Students look at voting systems for choosing among candidates or alternatives and use mathematics to understand problems that can arise with different election methods. They will study situations in which a group must decide on a single alternative, such as a bill or amendment. Students will explore the mathematics of apportionment, the problem of dividing up objects into shares fairly, using as the main example the problem of dividing up seats in the U.S. House of Representatives among the states. Cool factor: For those who have ever wondered why elections can produce results that seem to be contrary to the preferences of the majority of the voters, using math to study voting procedures will help to understand the answer to this and related questions. Students get to see lots of real world examples and will even see how math changed history. Course description: This class studies the correlation between migration and identity, beginning with the premise that border regions, located at the cultural and geographical intersection of nation-states, offer an ideal place for questioning the construction of new individual and national identities. Students think and write about how new identities are established, embodied and challenged, and how borders create a continual negotiation of the self and the other. Drawing on anthropological and popular media representations of the migrant and refugee crisis, they will paint a picture of the current state of transnational migration and distinctions established between migrant, citizen and refugee. Cool factor: Integrating ethnography, journalism, film and other forms of popular media, this course begins with an exploration of the current migrant and refugee crisis unfolding in Europe, but soon moves beyond the E.U. to explore the lesser-told stories of migration, deportation and detention unfolding on the periphery. Over the course of the semester, students will work together to build an interactive website that brings these issues to light for popular audiences. Course description: This course recovers the multiple histories of human rights from their deep origins in the 1750s to their more recent formations in the 1990s. It focuses on the history of Europe and its engagement with the wider world: looking at how Europe has shaped and was shaped by Africa, South Asia and the United States over the course of the 19th and 20th centuries. The goal will be to analyze how the evolution of human rights became part of our contemporary framework of politics, law and culture. Cool factor: Former U.S. President Jimmy Carter will be a guest speaker in the class. Carter proclaimed human rights as “the soul of [U.S.] foreign policy” and his administration was a pivotal moment for the international history of human rights. Course description: This four-week elective is for senior medical students planning a residency in surgery, a surgical specialty or obstetrics/gynecology. Students engage in daily cadaveric dissection labs, conducted by specialized surgeons, and receive hands-on training in a variety of chest and abdominal operations in fresh cadavers. They are also checked off for proficiency in over 20 clinical skills they will need as interns, including mock nurse calls, insertion of central lines, suturing and knot-tying, basic laparoscopic skills and other technical skills, plus simulated scenarios that test their ability to respond to emergencies in the trauma bay and surgical ward. Cool factor: Special labs in ultrasound for surgeons and vascular suturing, group discussions on issues in professionalism in surgery, how to do operative dictations, and a day of “Surgical Olympics” round out this surgery intern prep experience. Students get a chance to learn, practice and refine surgical skills and techniques in a safe, supervised and closely monitored environment. The course also teaches and reinforces anatomical knowledge, topography and anatomical variations that are essential to practicing surgeons. Course description: This course focuses on biblical texts from the Old Testament (or Hebrew Bible) that deeply trouble modern readers, causing them outrage or pain. Students will study the historical context and the history of interpretation, discovering along the way that these texts, more than any others, can help us understand the Hebrew Bible’s distinctive purpose and message. Cool factor: This is in the Bible: "How blessed will be the one who grabs your babies and smashes them on a rock!” It is from Psalm 137, which inspired the Rastafarian song “By the Rivers of Babylon.” It joins numerous other troubling verses that strike fear or outrage in the hearts of biblical readers. How are we to interpret and understand these texts? The course is organized for all to take part in a lively debate on difficult issues. Course description: This seminar will focus on the nearly 150 textiles on display at the Carlos Museum in the exhibition “Threads of Time: Tradition and Change in Indigenous American Textiles.” Focus is placed on the ways in which fiber arts incorporate new elements within the continuities of their cultural traditions. The museum collection has over 500 pieces not included in the exhibition, allowing for original research to be conducted. One Andean, one Guna and one Maya piece will be the subject of three small projects. Museological practices — research, object selection, case design, installation — will also be covered. Cool factor: The past is only directly available to us in the elaborate and beautiful material objects made by our predecessors. Furthermore, literal hands-on research on ancient and modern textiles is a rare opportunity because these are notoriously delicate objects usually hidden away in dark museum storerooms. While the 150 examples in the Michael C. Carlos Museum show have been researched, the other 500 in the museum storage are largely unexplored. Thus, students can create new knowledge, which is arguably the ultimate goal of a college degree and the academic path. Course description: Students in this course will learn to think in an interdisciplinary way by engaging with the question: "What does it mean to be human?" The instructors will represent their own disciplines (neuroscience, biology, physics, interdisciplinary studies) while guiding students in discussion and writing addressing big questions, such as: How do we retain identity through a life transition? How do we approach the challenge of doing good things? What value does university learning have outside of a university? This course seeks to cultivate interdisciplinary perspectives even as students choose and commit to a particular major at the university.